Finally I am here with the winners of Royal Feast - Biriyani and a cold drink to toast the winners. Days are becoming harder with the snow fall, yes snowfall in February and it is affecting every aspect of everyday life. I am not a person to mourn but when the normal walk to work poses a risk of a fall and fracture, it is only then the seemingly innocent things don't appear innocent ... I mean the snow. Ginger and honey makes a wonderful combination no matter what and we know what the nutritional benefits are. This is very a simple drink to brew the golden liquid, chill to a cold splash , add some fresh fruit and serve with a mint leaf. The drink is very refreshing and the fruity bite at the end of the drink is yummy.... at least for me. You can skip the addition of fruit completely and have the tea without the fruit. The fresh mangoes infuses a mild fruity flavour to the drink and you can have this drink when it is warm which actually soothes your throat. This can be made ahead of time.If you want to serve it cold brew the tea about 5-6 hrs ahead of time but if you want to serve it warm just an hour before serving time would be sufficient. Runny honey: as per your taste. Fresh mango pieces: 1 cup. 1. In a tall jug pour the hot boiling water. Add the tea bags and chopped lemongrass to the water and let it sit for 1/2 hour. 2.After 1/2 hour filter the brew into another jug. Discard the tea bags and lemongrass pieces. 3.Add the cold water, honey and mix well. Refrigerate until cold. 4.Half an hour before serving add the mango pieces and refrigerate until serving time. Serve topped with ice cubes and fresh mint leaves. Before announcing the winners, here are some of the entries that were sent through email to me. 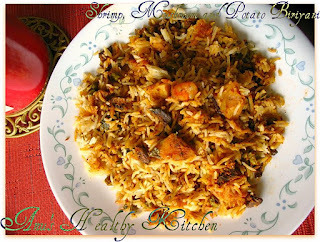 Shrimp Mushroom and Potato Biriyani from Anu. Nadan Chicken Biryani from Ganga who has also sent in three other entries. There is a visual feast waiting for you from Asiya Omar. Her blog Samaithu Asathalam is truly a treasure when it comes to food. It mainly features non-vegetarian food mainly from the Muslim community [which is my favourite] but she also posts about poetry, real life experiences, short stories etc. She has authentic traditional recipes from "Melapalayam" which is a small town in Thirunelveli District in Tamil Nadu. She has sent in a video link for "Nellai Mutton Biriyani" which is just awesome. Thanks Asiya akka for this link... I really enjoyed watching the making of yummy biriyani. Do check out the link here : Nellai Mutton Biriyani . It is Christy Gerald of My Kitchen Flavors and Lubna Karim of Kitchen Flavours. Congrats girls ... Do send me your address to my email id : kaarasaaram@yahoo.co.uk as soon as possible and I will post the cookbook to you guys. Congrats to the Lucky Winners of the Great Event- Christy and Lubna. this looks very healthy and refreshing.Beautiful Clicks. My hearty thanks to your best compliments Reva. Thanks for stopping by Reva, tea looks so colourful and love the colours! The tea looks refreshing... I've never added fruit to tea before but I like the idea, will try it. The drink is a complete winner Reva.And the clicks are truly worth it.Since the pictures of drinks are very difficult aesthetically.You have done it. What a refreshing and delicious cooler. Wonderful drink. I love the ginger honey tea and with mango can imagine the flavors. Very beautifully captured. Drink looks refreshing...Congrats to the winners..
wow so refreshing and delicious one !! Congrats to the winners !! Truly delighted to hear that Big n Sweet surprise Dear.Really wanted to win that Book frm U. Thanks a lot Reva Dear for hosting this Great n Yummy Biryani Event and let me be part of this.Thanks again. Wow,Very innovative Combo n refreshing Tea Dear. Deliciously made and displayed as usual. Will soon post a recipe as soon as I receive the Book Dear. Thanks again all. Awardwinning drink with such beautiful clicks......awesome. wow ! Mangoes in winters - how did you manage to get them , Reva ?? :) superb clicks and yummy drink ! Congrats to the winners too ! So yummy n very refreshing tea. Oh my Gosh, you have so much going on in your blog, I am just a novice, love the way you present your dishes, will be happy to come back. Hi Reva, Congrats to the winners. The drink sounds so summery and refreshing. Even by looking at it ..I am already feeling refreshed:-) Lovely flavors! Lovely blog !! Nice pictures !! Drink looks so refreshing !! Will be here often !! mmm so many YUM biriyanis for me to try and that mango tea also looks so refreshing! I feel like gulping down both the glasses all by myself. Looks so refreshing! Loved all your clicks... n Nice treat of biryani's too. wow very nice biriyani collection dear...and congrats to the winner! wow..awesome!! Loved your clicks too! !